As large machinery manufacturing companies like Doosan and Bobcat begin to increase their competition against one another, the construction world is becoming more privy to some of the best pieces for detailed construction equipment. With enormous capabilities and unbelievably strong operating systems, the excavator is one of the most common types of equipment being upgraded in order to be the best in its class. Improvements include changes in size, new parts and/ or stronger engines. Bobcat and Doosan will stop at nothing to prove that their digger is the best in the industry. Depending on your immediate job related needs, either machine could prove to be your most important piece of worksite specific construction equipment. Competing with the likes of the Bobcat E63 and E85 excavators for sale, Doosan has come out with their stronger, faster and better performing DX140LCR-3. A gigantic piece of machinery it is made of 16 tons of metal. This new Doosan model has greatly reduced its tail swing to provide less length for the excavator while greatly enhancing its mobility. With specific characteristics that are unlike any specific Bobcat prototype, the incredible DX140LCR-3 is said to considerably improve the ability to develop virtually all construction locations; both residential and commercial. Probably the best feature of the amazing new Doosan excavator model is the highly recognizable small tail swing. Possessing a radius of just 5 feet, the DX140LCR-3 is regarded as ideal for small, congested job sites like narrow roads and areas that are close to buildings. For example, this Doosan excavator is ideal for highway digging, as its small size will be able to prevent the buildup of any unnecessary roadway traffic. Weighing in slightly lighter than the DX140LCR, barely less than 14 tons, the Bobcat E63 is definitely one of Doosan’s main competitors. Also having a smaller tail radius than most excavators, this machine has an incredible tail radius of only 11.6 inches. Proportionate to its weight, Bobcat has moved the top tier of the E63 to the back of the apparatus so that the materials that are being carried can rotate in balance with the excavator. While the Doosan DX140LCR is still able to carry heavier loads than this model, the E63 does make a case for itself with the model’s amazing power. Making the competition much stronger between the two construction equipment giants, Bobcat decided to give their excavator some of the strongest power in the industry at a 13.5% horsepower kick that can get up to as much as 59.4%. Ideal for larger, heavier loads, the E63 will absolutely be able to handle just about anything that it carries; even at its relatively small size. 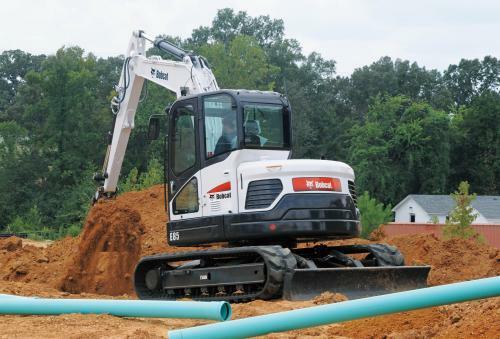 To make their extremely competitive machine even better, Bobcat added various supplementary flow currents and one extended flow to allow the variety of E63 attachments to perform better regardless of the specific job being performed.